Though targeting a very young audience, serious Tom and Jerry scholars will be interested in the new release of Tom and Jerry Kids Show – The Complete Season 1. This is the first time the 1990 animated series has been issued on DVD. The two-disc set contains all 13 first season episodes, each approximately 21 minute and consisting of three seven-minute shorts. Not completely unlike shows such as Muppet Babies, Tom and Jerry Kids Show offered younger versions of the famously antagonistic cat and mouse. Besides being drawn differently to project a youthful air, Tom wears a little baseball cap and Jerry a bowtie. Hanna-Barbera, the characters’ original creators, executive produced the show and apparently saw to it they weren’t too kidified. Neither Tom nor Jerry speak and there is still plenty of creatively cartoonish abuse hurled each other’s way. It’s nice to see some previously unavailable Tom and Jerry material emerge from Warner Home Video after numerous budget-priced repackaged compilations. Tom and Jerry Kids Show is likely to serve as either a fun shot of nostalgia for those who watched the original broadcast or a great introduction to today’s young viewers who are new to the characters. Lots of sidekicks turn up regularly, including father-and-son dog duos Spike & Tyke and Droopy & Dripple. While the standard definition DVD presents the baker’s dozen episodes in their original 1.33:1 aspect ratio, not much has been done to tidy them up. Still, the source elements appear to have been pretty clean. It looks like exactly what it is: early-‘90s kid-oriented animation, with a few white specs or other artifacts showing up now and again. 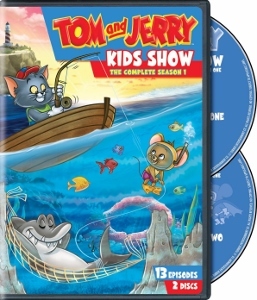 There are no special features, but with more than four hours of content at a very reasonable price, Tom and Jerry Kids Show – The Complete Season 1 is a great addition to any Tom and Jerry collection.